Democrats swept all the statewide races on Tuesday and took control of the state Senate for the first time since 2010. ALBANY - New York was already a blue state. On Election Day, it got even bluer. Democrats swept all the statewide races on Tuesday and took control of the state Senate for the first time since 2010, while the party won key congressional races that helped it win control of the U.S. House. Gov. Andrew Cuomo was re-elected and will serve a third term after handily defeating Republican Marc Molinaro, while Letitia James was elected as the first African-American attorney general and Tom DiNapoli won a third term as state comptroller. "I’m proud of the statement New York has made especially in light of what is going on nationwide because once again New York state defines what it means to be the progressive capital of the nation," Cuomo said in his acceptance speech. In 2010, Cuomo won his first term by beating Republican Carl Paladino by 63 percent to 33 percent. In 2014, he beat then-Westchester County Executive Rob Astorino by 54 percent to 40 percent. Against Molinaro, the Dutchess County executive, Cuomo ended up in the middle. Cuomo was leading Molinaro 59 percent to 36 percent early Wednesday morning. While Molinaro won more counties, Cuomo won the largest ones. He crushed in New York City; won Westchester and Nassau counties; and won the biggest upstate counties of Erie, Monroe and Onondaga. Molinaro called for unity in the state after his defeat. "We are an amazing state. We are diverse as we are united. And we have far more in common than what divides us," he said. Turnout was up. Way up. It wasn't even close: Way more New Yorkers headed to the polls than the last two midterm elections. With 95 percent of precincts reporting, about 5.6 million people cast a ballot for governor in New York this year, up from the 3.9 million in 2014 and 4.7 million in 2010. Ballots are still being counted, but statewide turnout looks to be around 50 percent among active voters. There were 11.6 million total active registered voters as of November 1, according to the state Board of Elections. There were plenty of signs turnout would be up. For one, more than 400,000 people requested an absentee ballot, close to double the amount that did in 2014. New York's September state-level primary also saw a huge uptick in voters. Voting levels did not approach 2016 presidential levels, however. About 7.7 million New Yorkers cast a ballot in New York that year. Democrats didn't just flip control of the state Senate. They won a cushion of at least a handful of seats. At least 35 seats were won outright by Democrats by 11:30 p.m. Tuesday, and a handful of others were leaning Democratic. There are 63 seats in the Senate. Republicans held control this year by a single seat, and even that was with the aide of a Brooklyn Democrat who sat with the GOP. "I am confident our majority will grow even larger after all results are counted, and we will finally give New Yorkers the progressive leadership they have been demanding," soon-to-be Senate Majority Leader Andrea Stewart-Cousins, D-Yonkers, said in a statement. Democrats swept control of New York's statewide elected positions. Again. No Republican has won a statewide seat since Gov. George Pataki won a third term in 2002. And with Democrats winning big all across New York, this wasn't the GOP's year, either. Cuomo easily won re-election, while Letitia James won the open attorney general position with more than 60 percent of the vote. The same can be said of Comptroller Thomas DiNapoli, who won a third full term with more than 65 percent of the vote. On the federal level, U.S. Sen. Kirsten Gillibrand picked up 67 percent of the vote, easily thwarting Republican Chele Chiavacci Farley. In a statement, state GOP Chairman Ed Cox said Republicans have "much work ahead" and are "committed as ever to our principles and holding our state's leaders accountable." "Tomorrow the fight to save our state continues," Cox said. Democrats appeared to pick up three congressional seats in New York, winning two upstate and the only GOP one in New York City. Rep. Dan Donovan lost on Staten Island to Democrat Max Rose, while Democrat Antonio Delgado beat Rep. John Faso in a district that stretches across the Hudson Valley and into the Southern Tier. 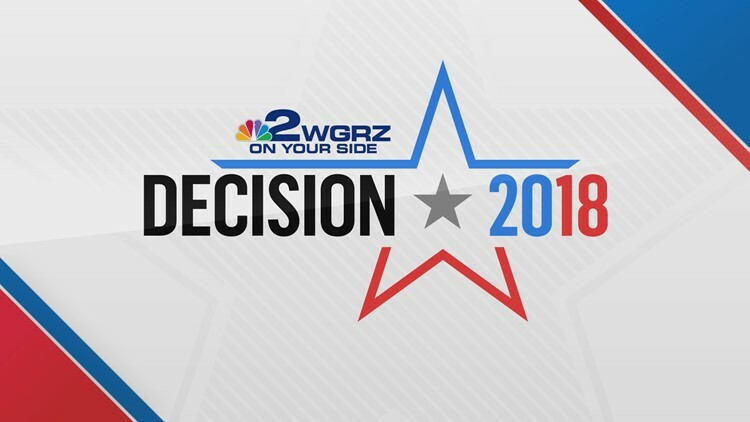 Rep. Claudia Tenney, R-New Hartford, Oneida County, was losing to Democrat Anthony Brindisi, a state assemblyman, in a district that runs through central New York. Tenney had yet to concede but Brindisi declared victory, holding a lead of about 1,400 votes. "With over 10,000 absentee ballots left to count, this race is still too close to call," said Tenney's campaign manager Raychel Renna. "Over the next few days and weeks our team will participate in the re-canvass process and review the absentee ballots."